Still in love with Nephrite, Naru becomes an unwilling tool in the power struggle between Nephrite and Zoisite. Despite Usagi's warnings, Naru is still in love with Sanjoin. Meanwhile, Nephrite examines the Black Crystal and wonders why it responded to Naru. He dismisses the idea that it detected her love, and realises that if Sailor Moon knows Naru's name, Naru must know Sailor Moon's true identity. Unbeknownst to him, Zoisite is lurking nearby, observing the Black Crystal. That night, Nephrite appears outside Naru's window. Again, the Black Crystal responds. He wonders if the Silver Crystal could be hidden inside Naru's body. Using the Black Crystal to look inside her, he finds nothing. Naru wakes up and, seeing him outside the window, calls for him. He replies that Sanjoin is merely an alias, and his real name is Nephrite. He says that her love has shown him the error of his ways, and that he would like to join Sailor Moon to fight against evil. Naru tells him that she doesn't know anything about Sailor Moon. Nephrite disappears from view, but remains close by, hoping that Naru will try to contact Sailor Moon. Meanwhile, Zoisite and three of his Youma are spying on Nephrite. Zoisite decides that Nephrite has fallen for Naru, and that they must take her hostage to trap him. Later that night, Usagi recieves a phone call from Naru, who tells her that Nephrite is looking for Sailor Moon. Nephrite overhears the phonecall. As Usagi runs to Naru's house, space begins to warp around her. Believing it to be the work of a Youma, she transforms into Sailor Moon. However, Nephrite is watching her, and reveals that he now knows her true identity. He attacks, but is interrupted by Tuxedo Mask. As he prepares to fight them both, he hears Naru's voice calling for help, and leaves. Outside Naru's house, Luna sees one of Zoisite's Youma carrying Naru away. Nephrite appears in her room and finds a ransom note, demanding the Black Crystal in exchange for her return. Nephrite defeats Zoisite's Youma and rescues Naru, although he admits to not knowing why he rescued her. Seeing that he is injured, Naru takes him into the park and dresses his injury. However, Zoisite's Youma return and impale Nephrite on energy draining thorns. They tell him to hand over the Black Crystal or they will kill Naru as well. Nephrite agrees and tells Naru to run, but she refuses and instead tries to pull the thorns from his body. When it looks as if she might succeed, the Youma attack again. 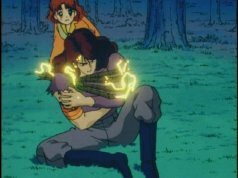 Nephrite shields Naru, but is mortally wounded. Zoisite appears and takes the Black Crystal, then orders the Youma to finish them off and disappears. The Sailor Senshi arrive and defeat the Youma, but they are unable to save Nephrite. He tells Sailor Moon that her identity will remain a secret, then fades away to nothingness in Naru's arms. This episode marked the death of Nephrite. This episode included the last of the three instances in which Moon Tiara Action was combined with another Sailor Senshi's attack; the others were in episode 11 and episode 21. Nephrite's impalement was not censored in the DiC English dub, despite the fact that impalements were typically edited for anime airing during daytime slots. It was removed in the Korean dub, however. Also in the DiC English dub, the scene where Neflite looked through Molly's clothes and body was edited to end when he got to her pajamas. This page was last edited on 26 July 2017, at 11:15.